I was back in New York to visit friends and as always, I had an amazing time. 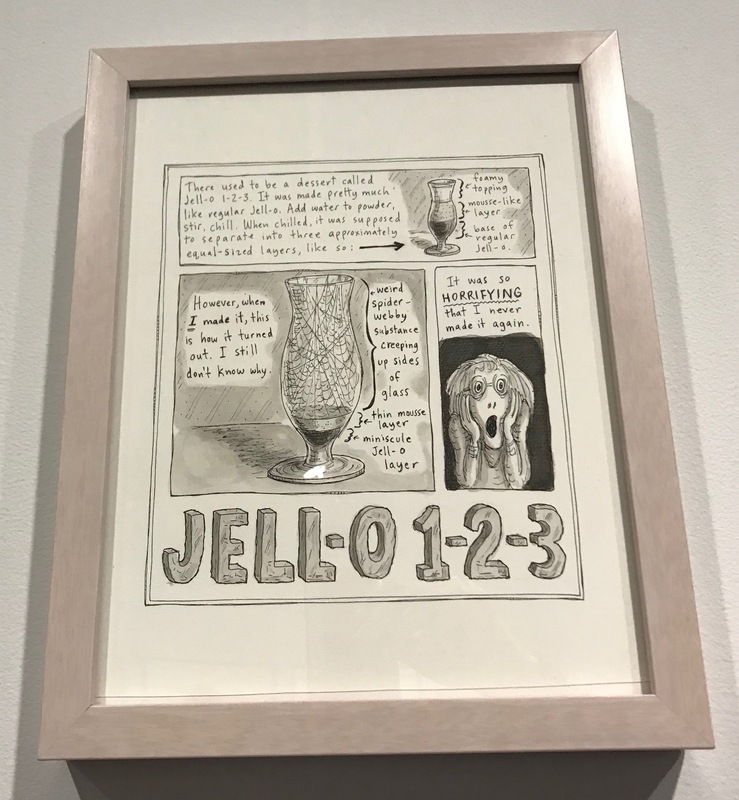 The above photo is from an exhibit in Chelsea of work by New Yorker cartoonist, Roz Chast. My sister and I grew up reading her stuff. This was the first show I’ve been to where you could here people chuckling as they walked around. My mother made Jello 1-2-3 for a brief, painful period in the ’60s. I had forgotten it until I saw this. And this one makes me laugh every time. 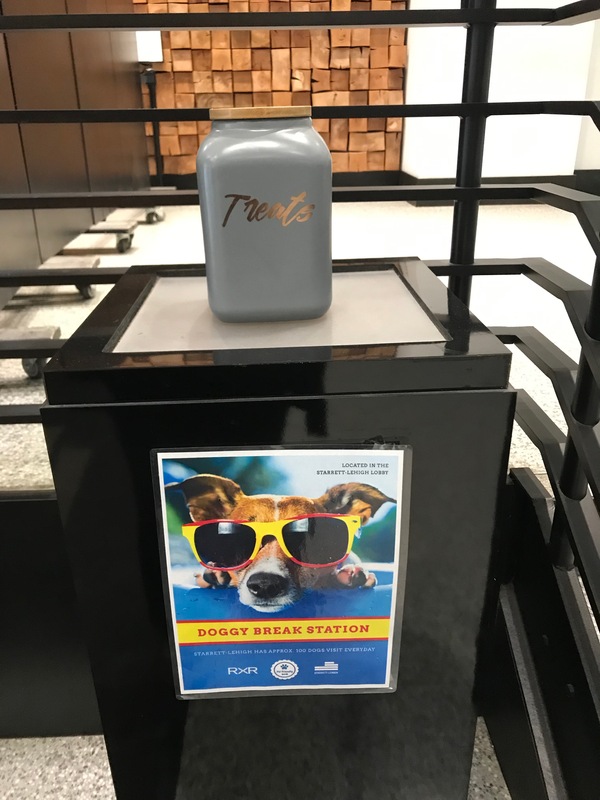 At the gallery entrance was this cute “break station” for dogs. There was also a bowl of clean water, which is out of frame. New York is in many ways the most dog-friendly city. 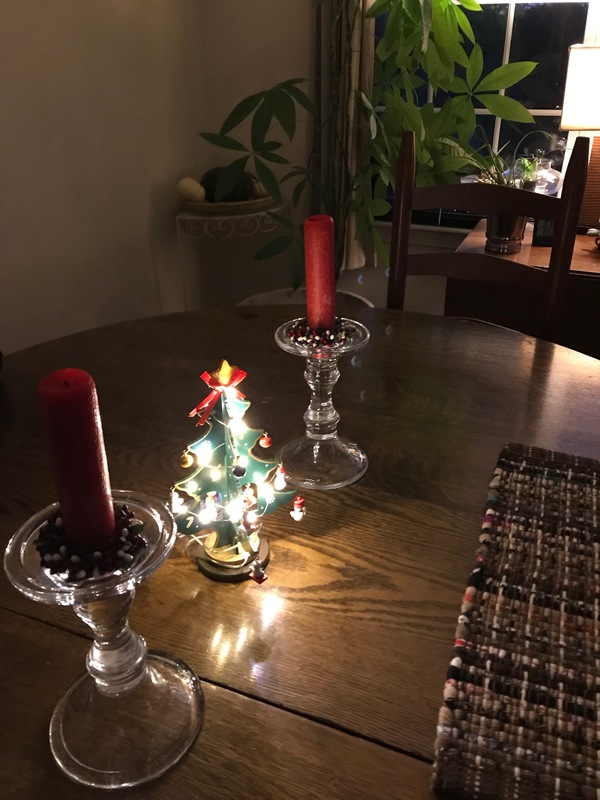 This is our tiny Christmas tree, which I retrieved from a ditch in our former neighborhood 18 years ago. It was the first and only time I have stopped to pick up a discarded item in a ditch, but something about it just got to me. The tree is only about three feet tall and stands on a table in our living room. 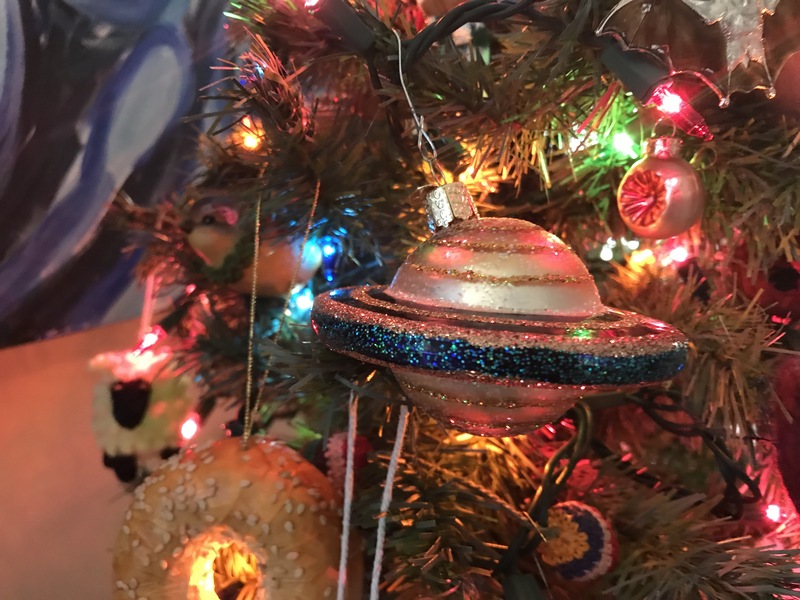 Once we bought lights and began collecting ornaments for it, it started to look pretty, and we’ve been putting it up ever since. 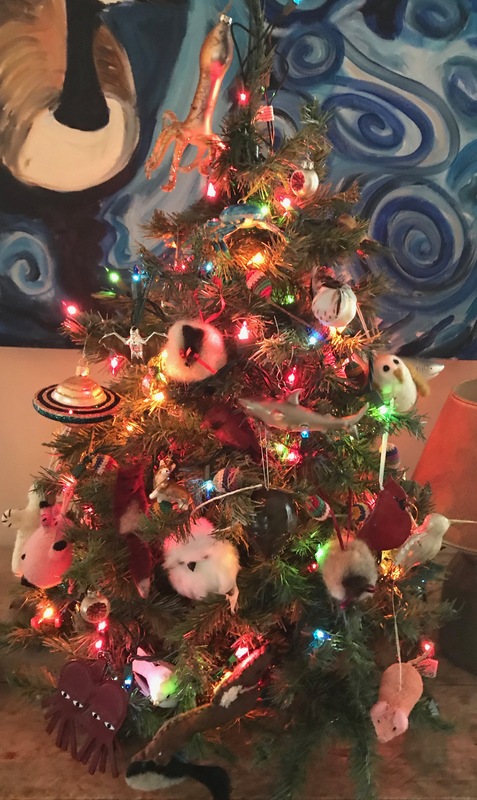 Many of the ornaments are designed for larger trees, but we don’t care. We just get what we like. 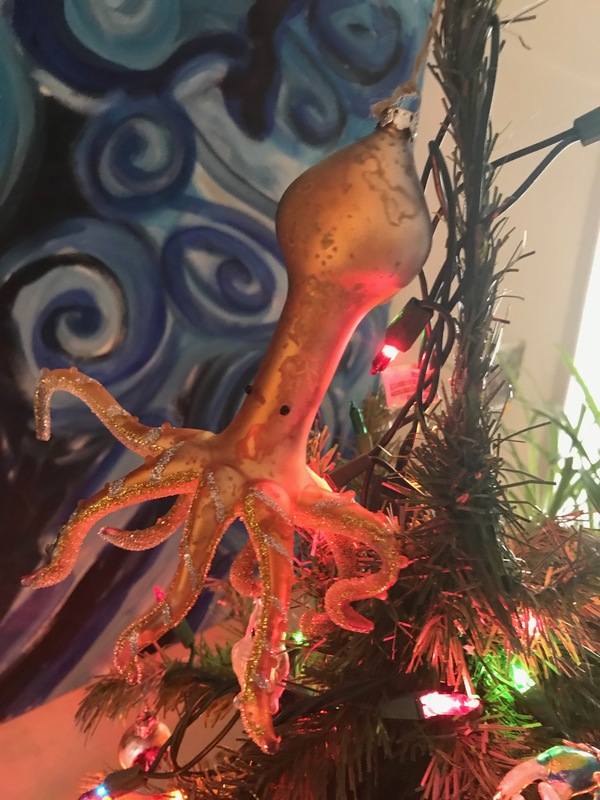 This squid was a gift from my husband, who bought it on a business trip in the Pacific northwest. 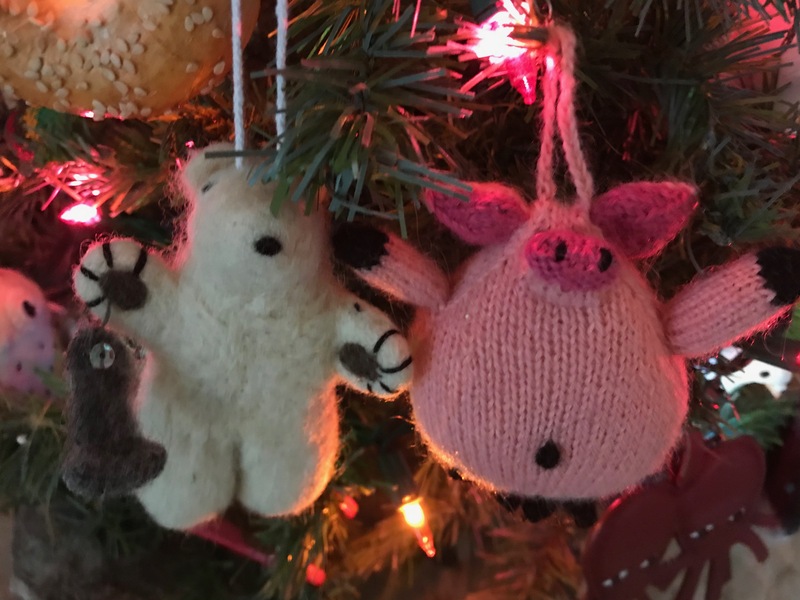 The polar bear is from my sister in Canada and the pig was made in Peru. I like to squeeze the pig’s stomach every once in a while. 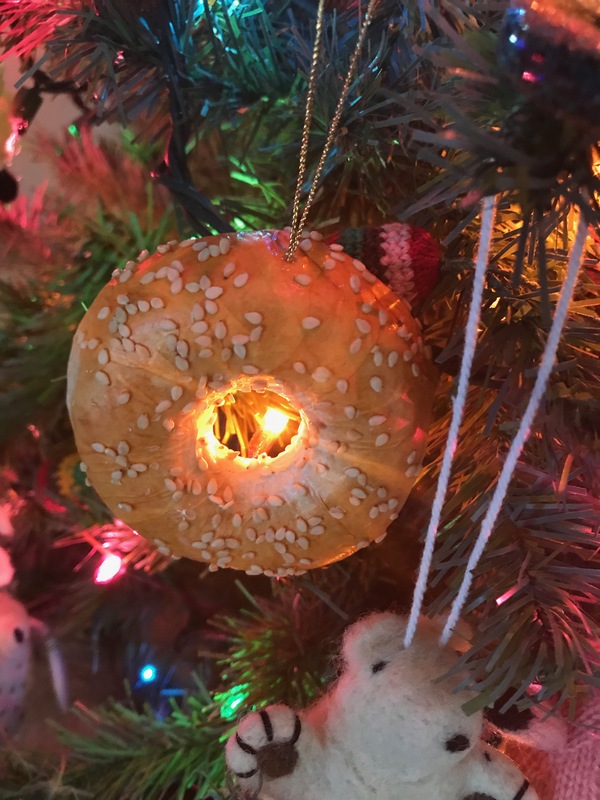 I found this little bagel at the Union Square Christmas market in New York City. I like how one of the lights shines right through the hole. 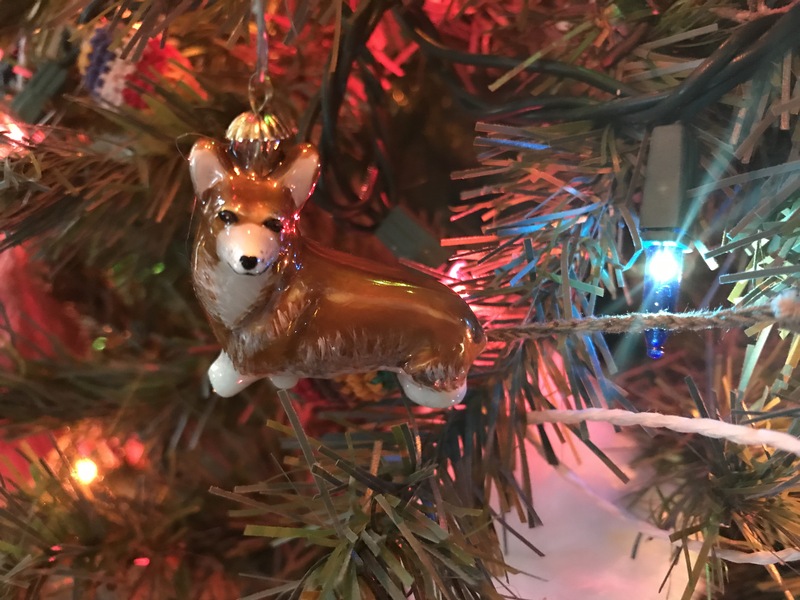 My sister-in-law gave us this sweet corgi. 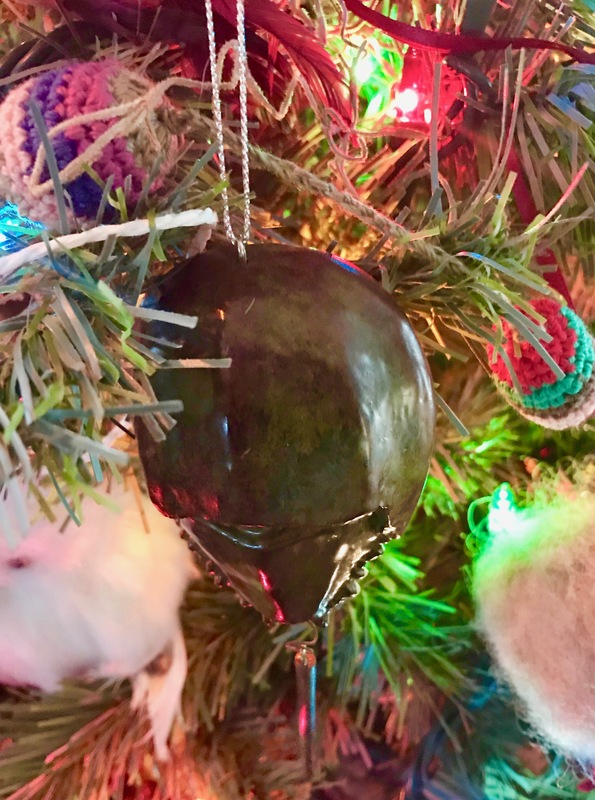 And what tree is complete without a horseshoe crab? We bought this in Maine. It is made of metal and very life-like. 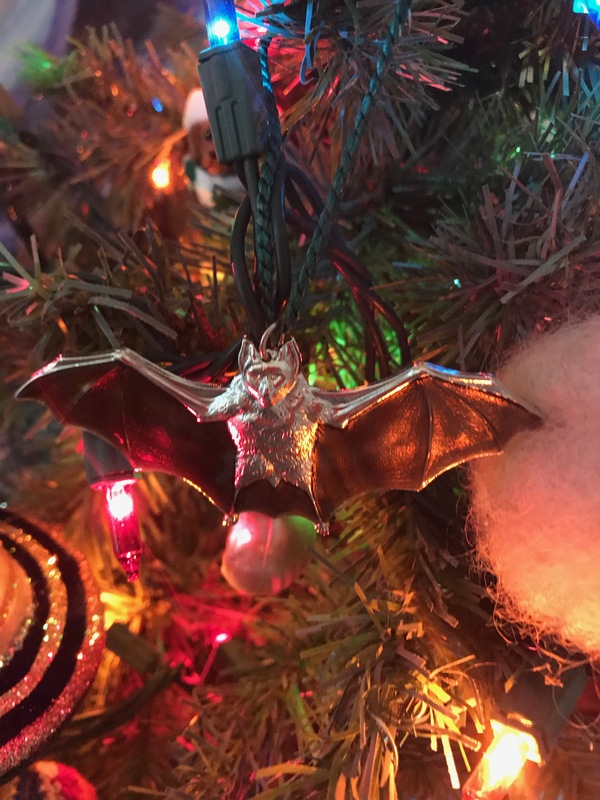 We are fond of bats. 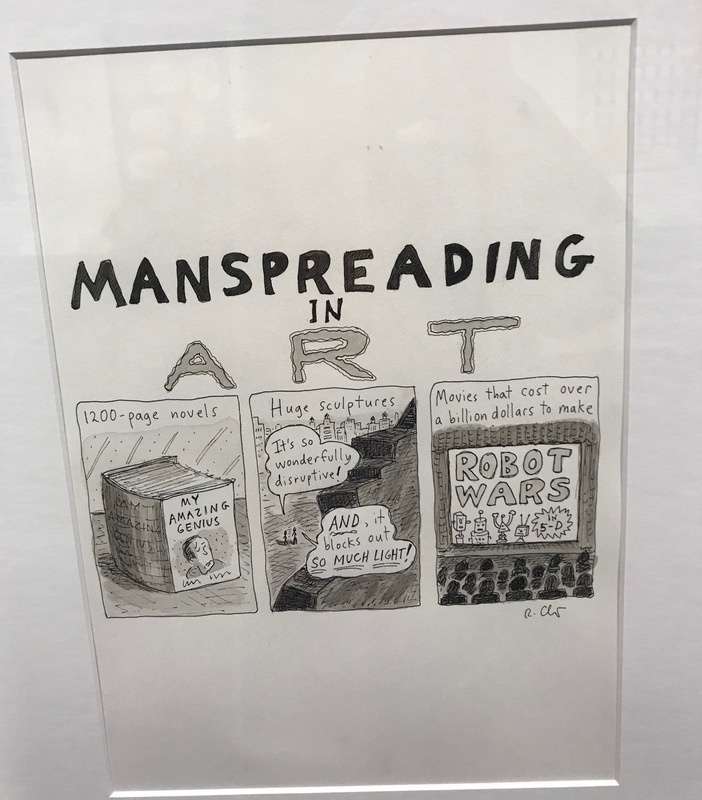 This was a find at another New York Christmas market, at the Cathedral of St. John the Divine. 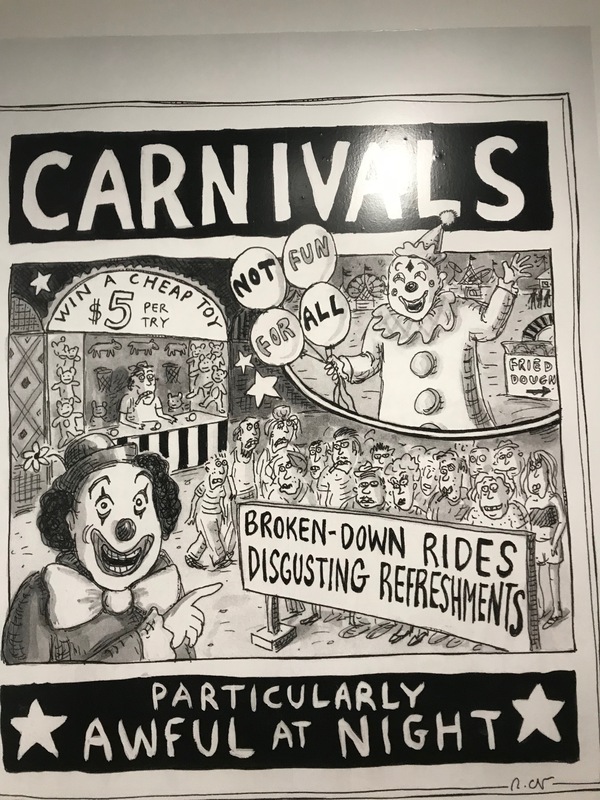 I bought it from the artist who made it. And our ’50s era flying saucer, purchased at a funky store in New York several years ago. I like how it’s tilted, as if in flight. Our other tiny tree comes from Germany. I bought it in Munich a few years ago. It is made entirely of wood, and has small, wooden ornaments. The tree folds flat and stores in a box that holds everything perfectly. I decided to enhance it with lights this year, and it is our centerpiece for the holidays. I wish all of you a happy, relaxing holiday and a peaceful and prosperous New Year. 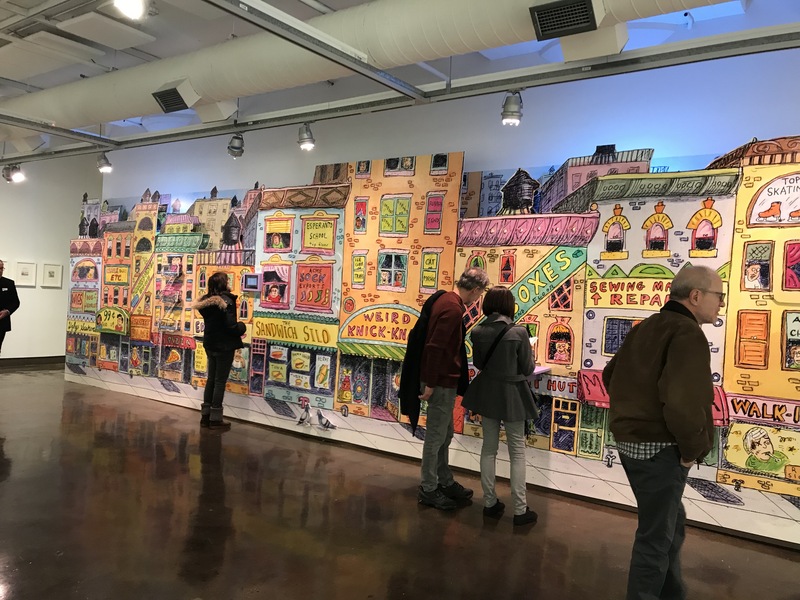 2019 will mark the 10th year (yikes!) 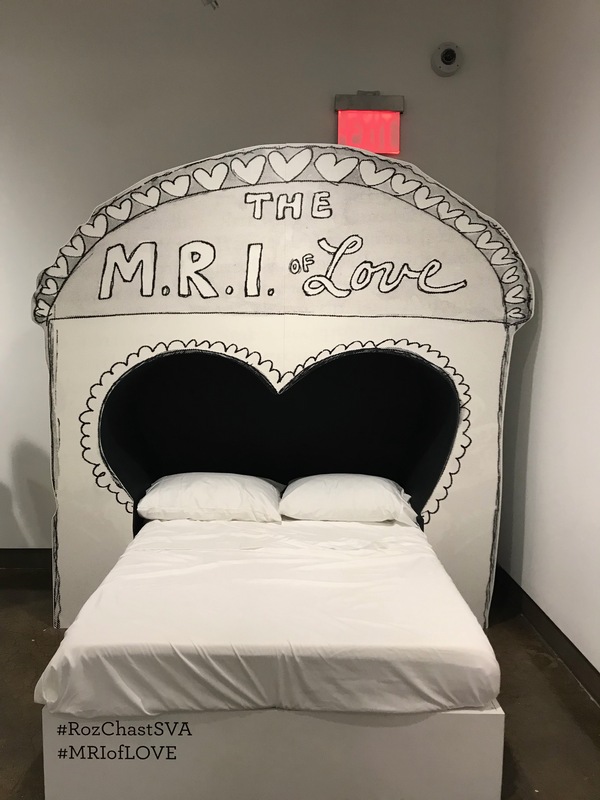 that I have been writing this blog. Thanks to everyone for reading. 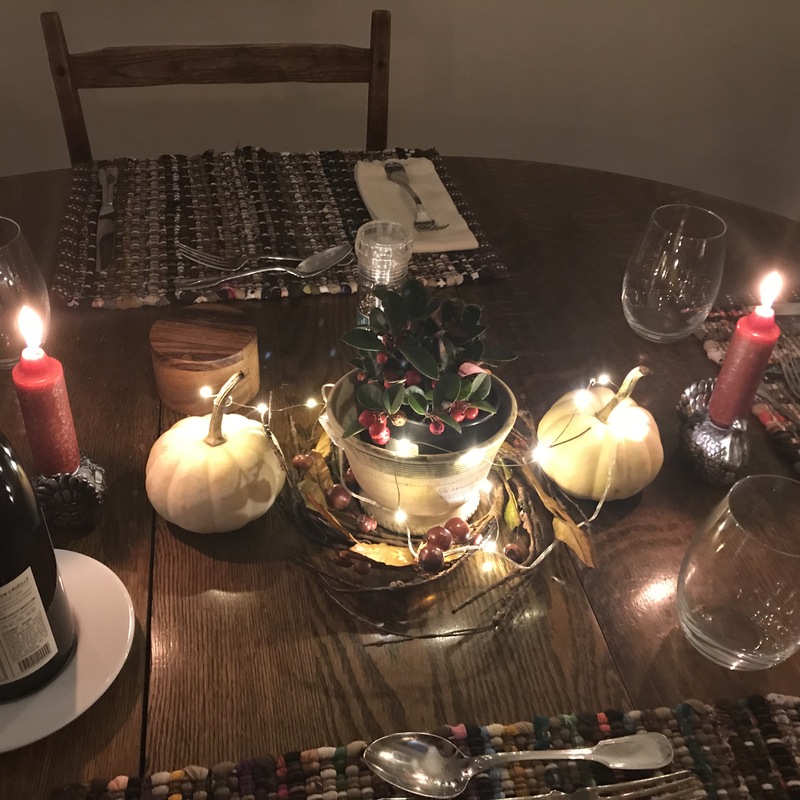 My sister-in-law took this photo on Thanksgiving, before we sat down to dinner. The tall white pine is one of the things I love most about our back yard. 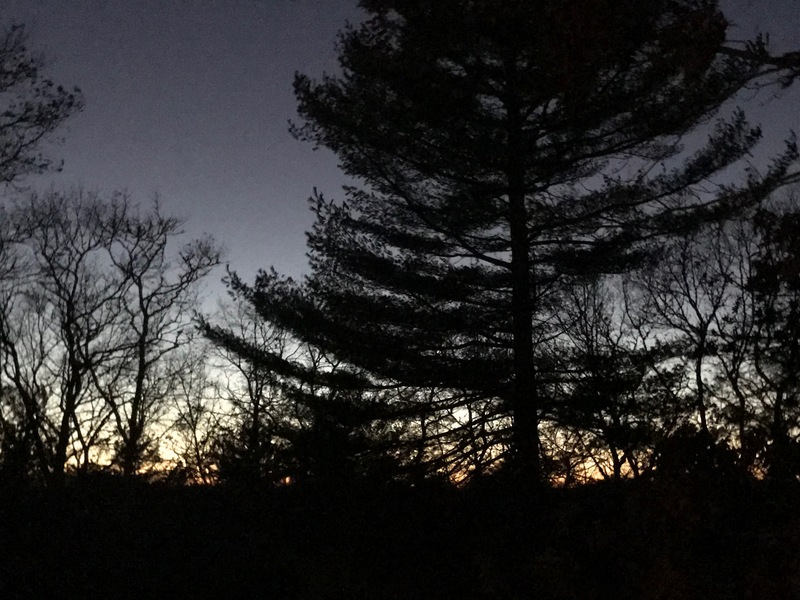 Another thing I love about our property is looking out the window and seeing nothing but trees and sky. A luxury in today’s world. I did something different with my table – at least for me. I wound some tiny lights around the wintergreen plant in the center to add a bit more light and atmosphere. The turkey candle holders were a score from Home Goods a few years ago. 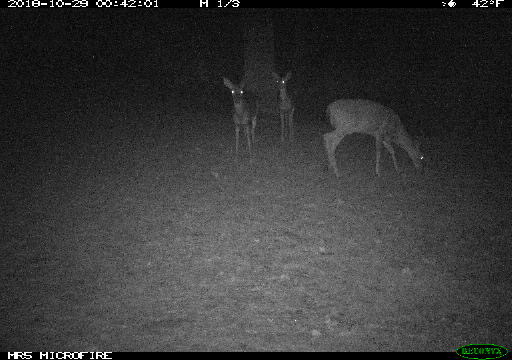 As we retreat indoors at this time of year, life outside goes on and our trusty game camera has captured shots of the nighttime visitors in our backyard. This doe and her twin fawns were a nice surprise. 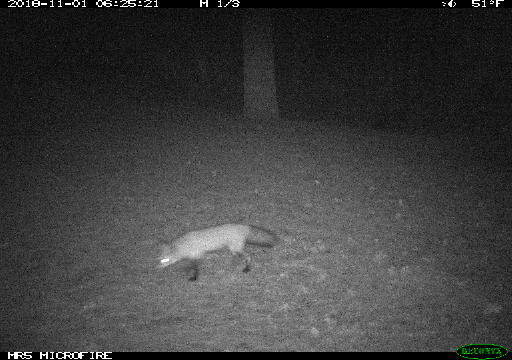 A fox makes the rounds just about every night. 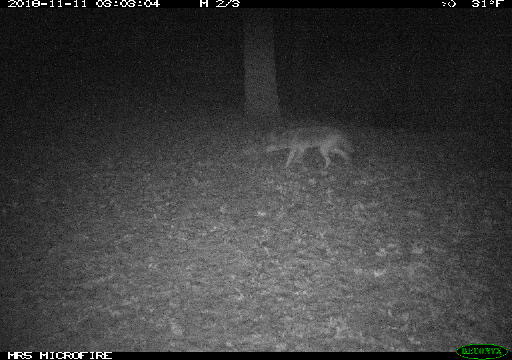 Coyotes are also regulars. This is not a place to leave your dog outside unattended, ever. It scares the heck out of me every time I walk by one of those houses with invisible fencing and a dog is sitting alone in the yard. I wish all my readers a happy belated Thanksgiving. I hope it was a peaceful, happy, relaxing day. 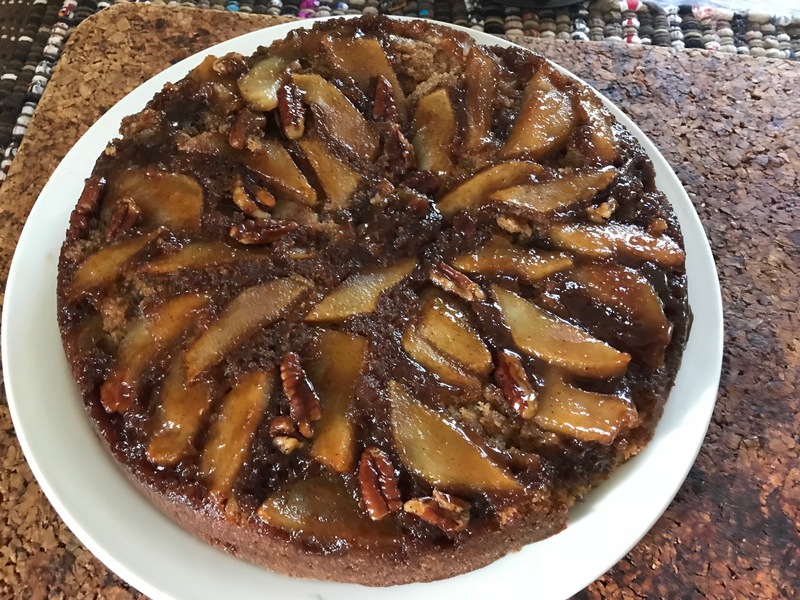 I used the apples I already had on hand. Two green Granny Smith – types that weren’t actually Granny Smiths but worked anyway. I found a couple of the instructions a bit odd, so here are some clarifications to make it easier for you to make it. One of the first things you have to do is melt butter in a 9-inch pan. I thought hmmm…. do they mean the cake pan? In the end, I decided to melt the butter and add the sugar and pecans all in the cake pan. I just kept an eye on the heat. I am not sure this would work with a gas stove, unless you kept the flame really, really low. My next moment of angst came when I had creamed the butter and sugar and added the water as instructed. The batter split in a most dramatic way, and I was afraid I’d lost it altogether. But I decided to just keep following the recipe, and sure enough, when I added the flour, it all came back together, so fear not. Other than those two things, this was an easy cake to make, and it kept well for a few days, too. Please drop me a line in the comments section if you decide to give it a try. 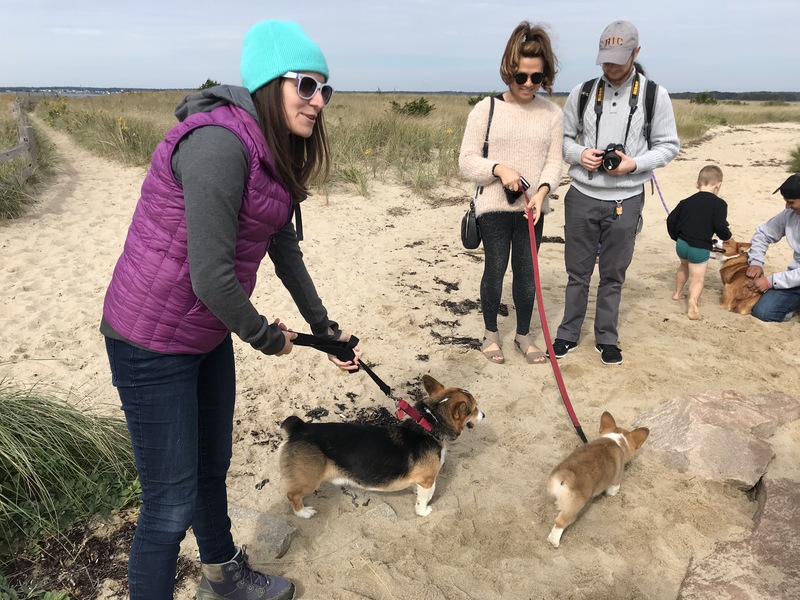 The natural beauty of Napatree Point in Westerly, R.I. was further enhanced recently by a gathering of corgis. 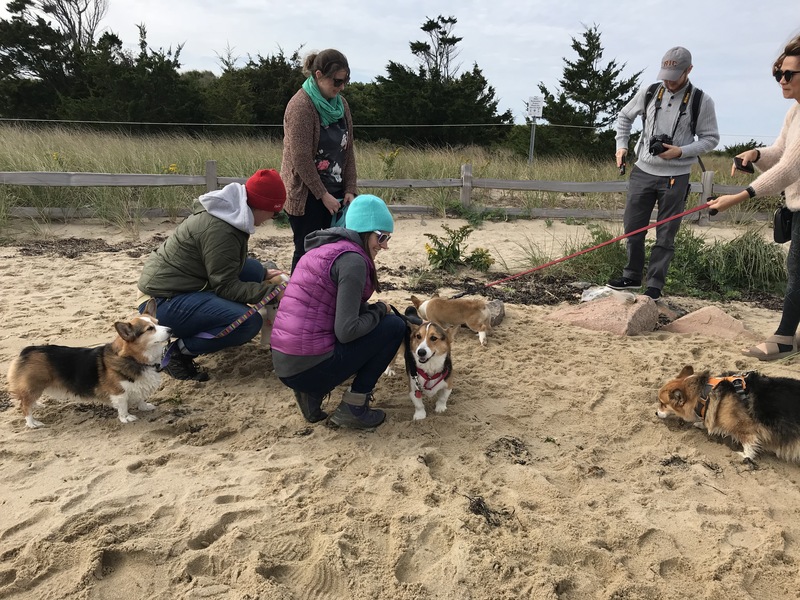 Organized by the Rhode Island Corgis group, it was the first of its kind on Napatree and I had to bring Fidgit. That’s her on the left with a crazed expression. There was even a three-month-old puppy, right, with the requisite pink belly and velvety puppy coat. My husband is still talking about that belly a week later. We met on the harbor side, so the water was calm and many of the dogs, including Fidgit, went swimming. 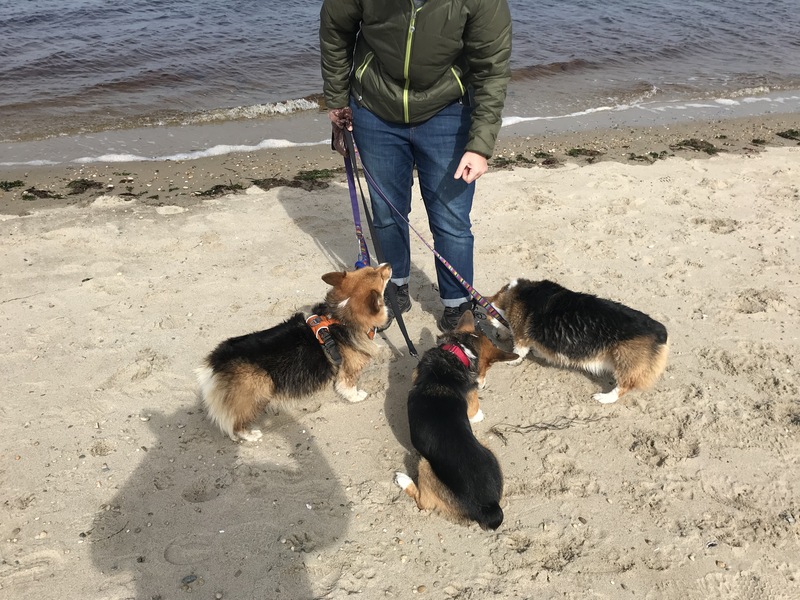 I have found that corgis are unambivalent about the water. They either love it and jump in whenever they can, or they hate it. It was a great afternoon with a group of nice dogs and nice people. 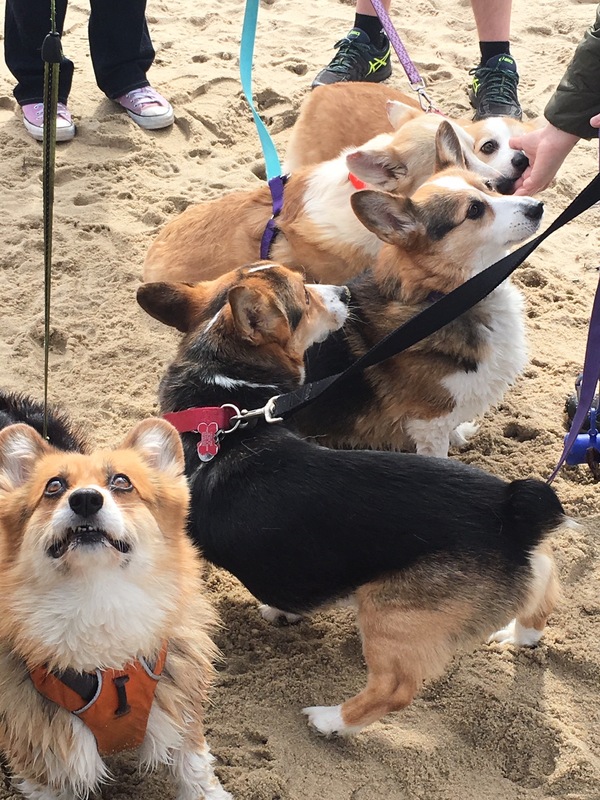 Thanks to Stephanie of Rhode Island Corgis for putting it all together. 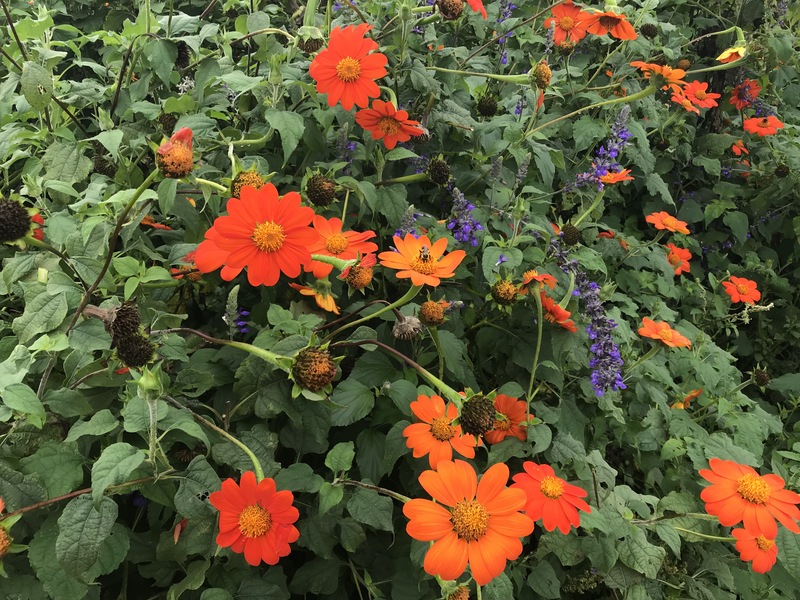 Ridiculously simple to grow, Mexican sunflower, or Tithonia, is a stunner all summer long, but is especially welcome in the fall. Here it’s paired with an annual salvia, maybe Indigo Spires. The combination of intense orange and intense blue is a real show-stopper. This Tithonia is “Torch,” my personal favorite. 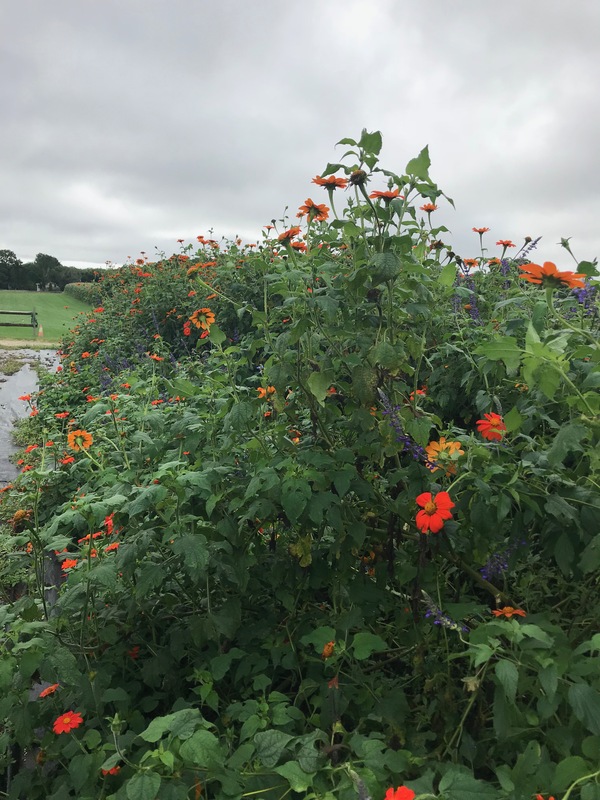 Tithonia is a tall annual, which is direct sown and prefers hot, dry conditions. Pollinators, including Monarch butterflies, love it. 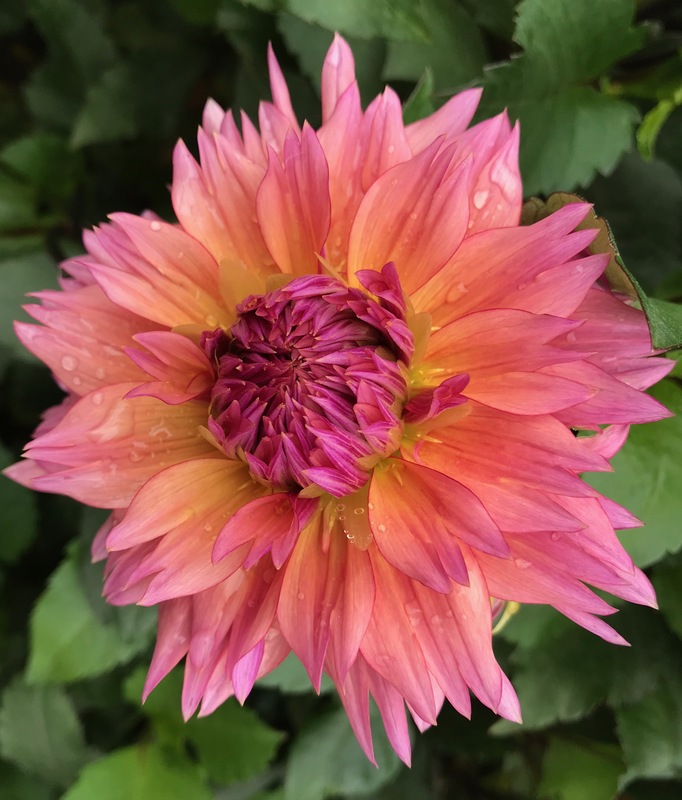 Some of the late-flowering plants, like dahlias, are at their best right now. This post contains a good helping of eye candy, so be forewarned. 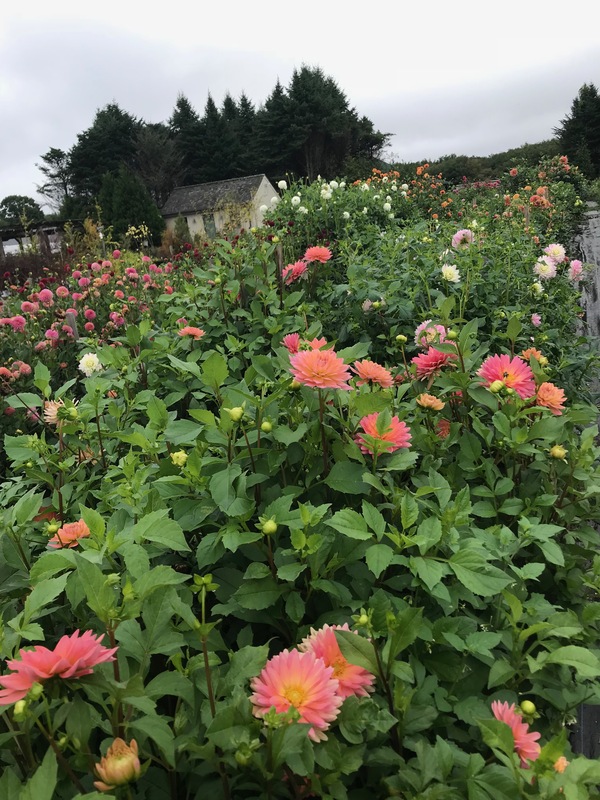 My favorite nursery has an impressive field of dahlias behind the greenhouse. They sell cut flowers and they also offer a cut-your-own option. It was interesting to see which flowers attracted pollinators. 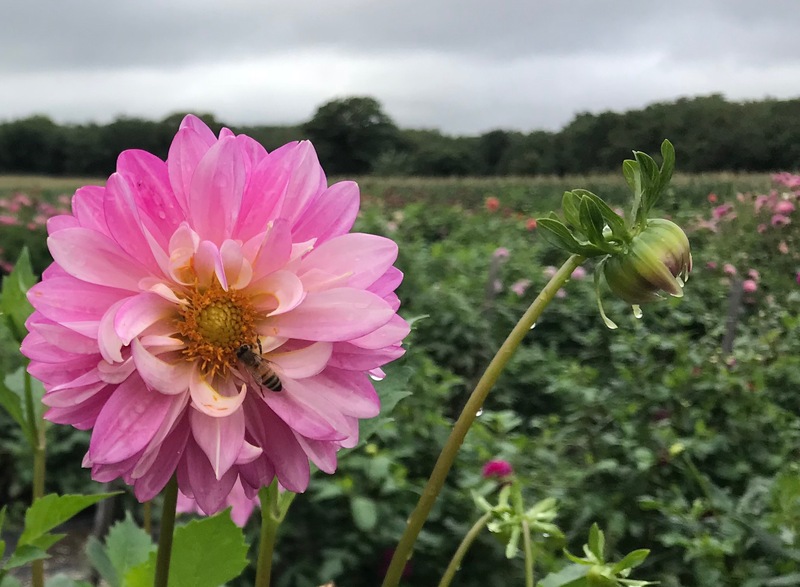 The pink dahlia in the above photo was covered in honey bees, while many others didn’t have a single one. 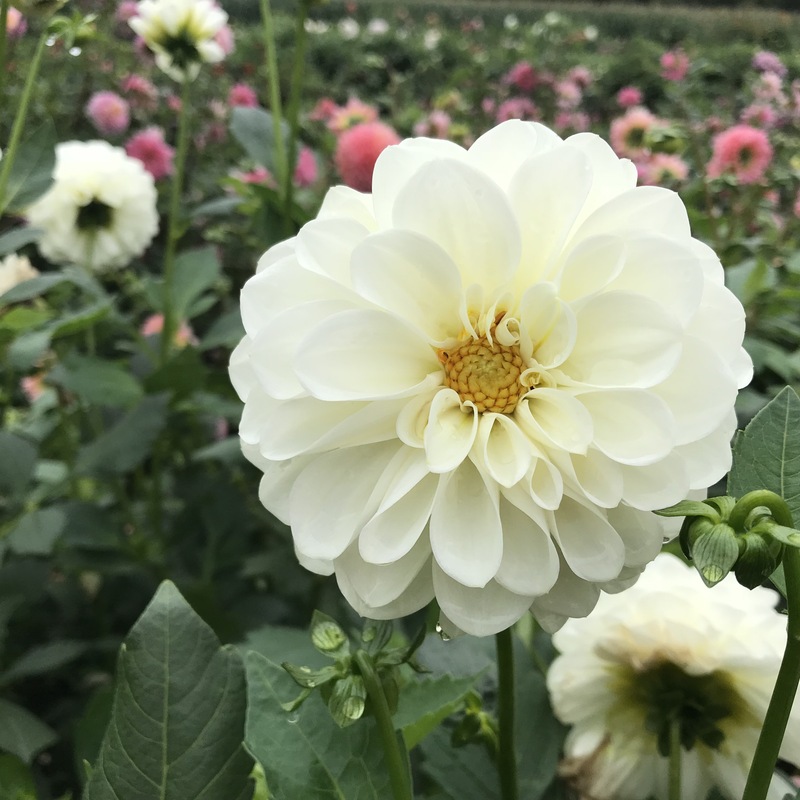 With dahlias, there is something for everyone. Some are demure, like this white-flowered plant. Others are more in your face. Despite the grayness of the sky, the blooms lit up the space. 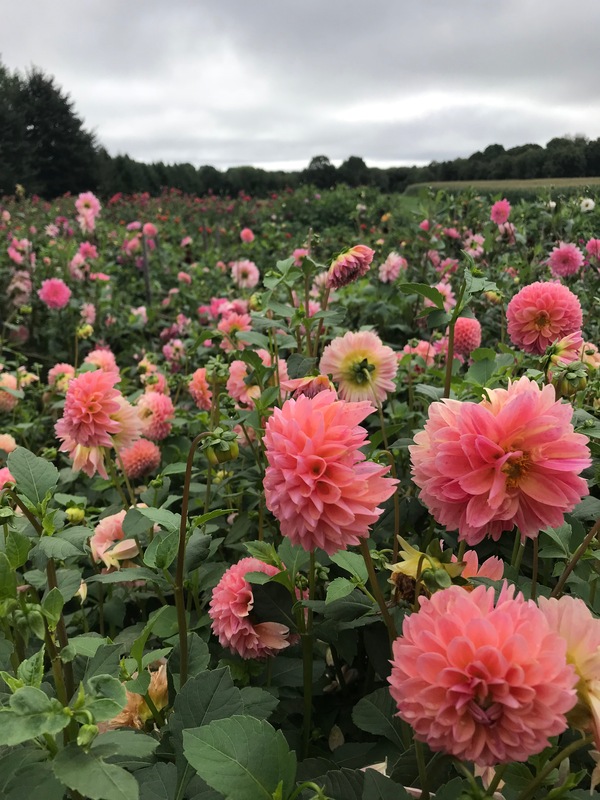 I was alone with thousands of dahlias, exclaiming to no one about how striking they were. I do not grow these plants, because I have never been able to store the tubers over the winter. They always seemed to rot no matter how dry the storage area, so I gave up. Another planting. This makes me want to drive over there right now and cut a huge bunch. I’ll have more late season bling in my next installment. 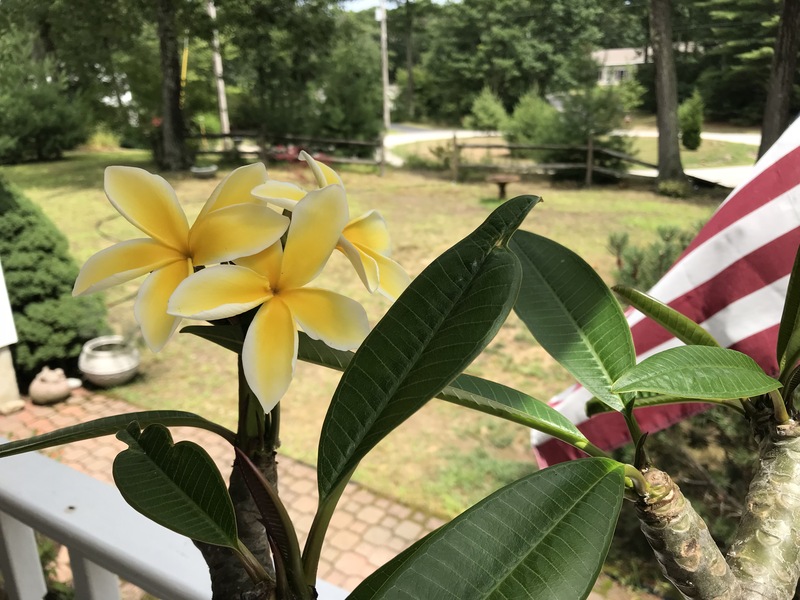 Maybe it’s habit from all those years of going back to school in September, but it seems fitting, on this Labor Day weekend, to write about my summer vacation. It only lasted two weeks, but the weather was great and my sister was visiting me from Canada, so we packed a lot into a short time. Of course, she wanted to spend time at the beach. 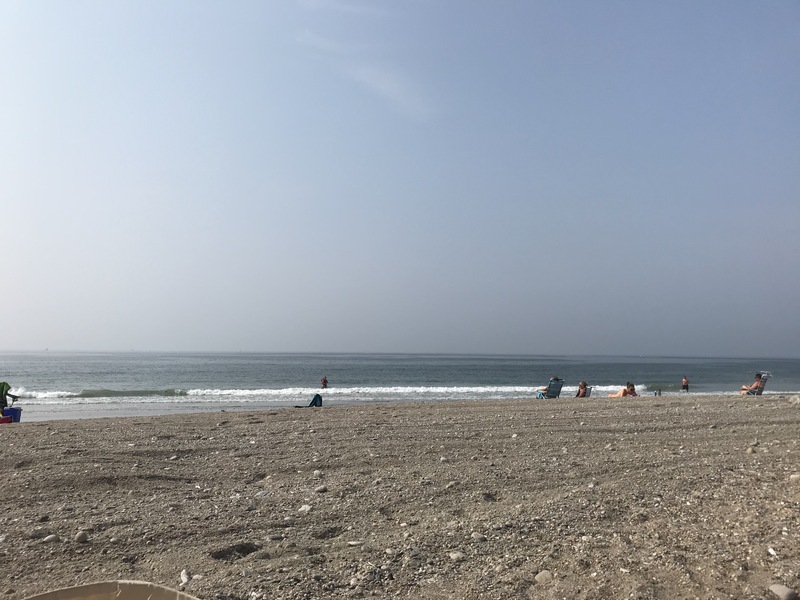 This is East Matunuck state beach, our favorite because of the excellent boogie boarding, which we still do with abandon. 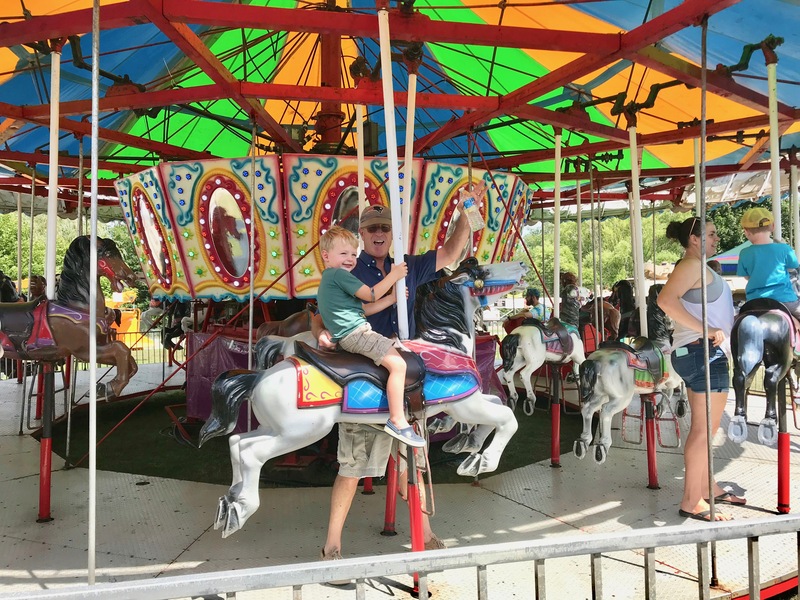 We couldn’t pass up the Washington County Fair. Here are a few images from opening day. 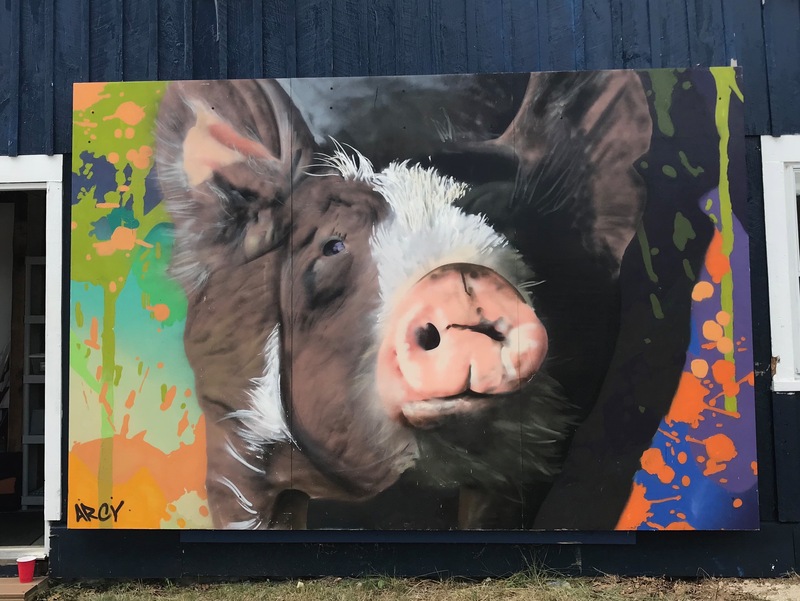 We loved this new mural on one of the buildings near the entrance. 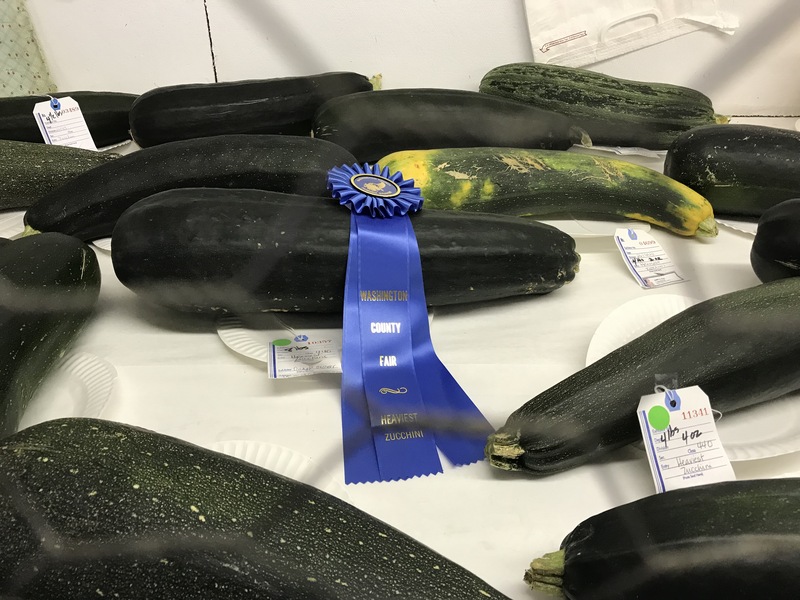 Here’s the zucchini that won first prize for being the heaviest – 9 pounds!!! I loved this scene so much I tweeted it, so forgive me if you have already seen this photo. 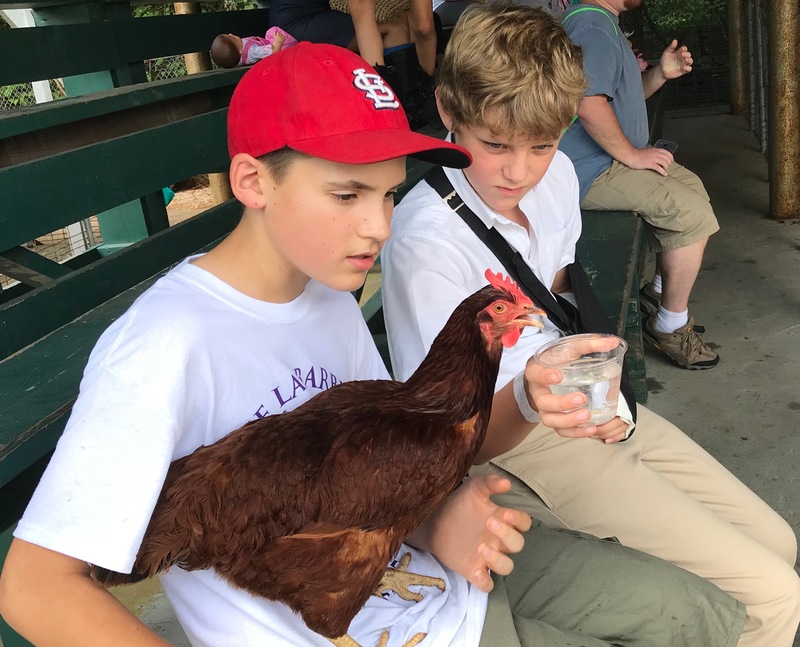 It was very touching to see the two exhibitors offering water to their show chicken on a hot afternoon. Their faces show such compassion. 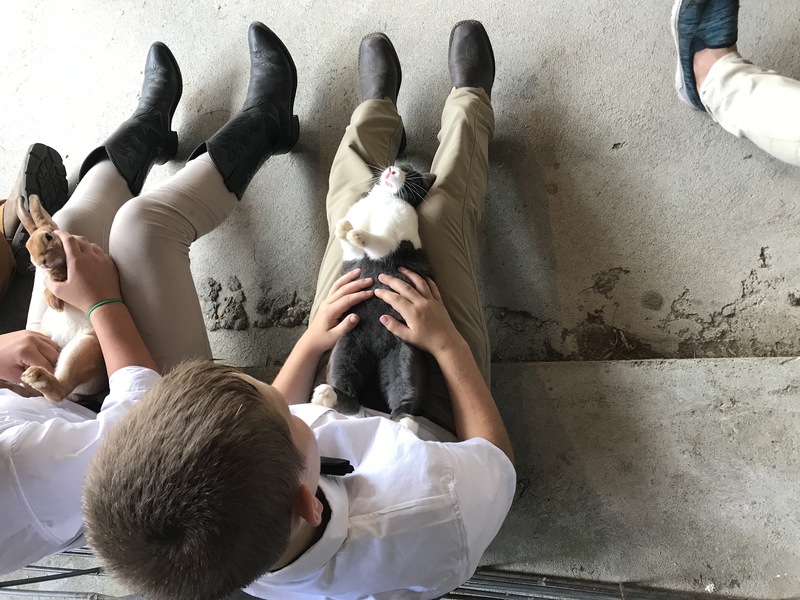 A boy and his rabbit, waiting to enter the show ring. I had a pet rabbit, (his name was Dennis) so I know that they will do this if they are relaxed and you put them on their backs. This rabbit was so chill, though. 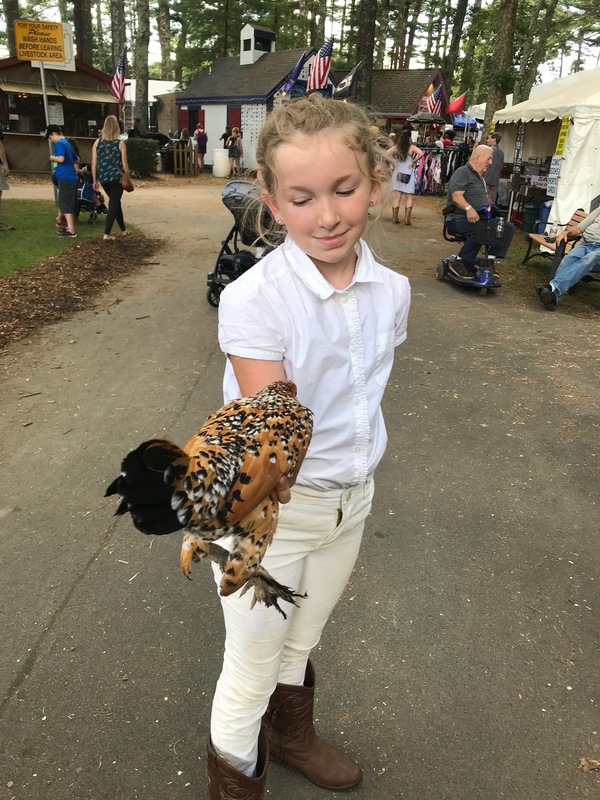 I asked this girl if I could take a photo of her with her beautiful chicken, and she obliged. We watched the carousel for a while. Just look at the joy on that little boy’s face! This made us talk about the fun things we did when we were little kids that we still remember today. Happy times stay with you. When we bought this house a couple of years ago, the covered front porch was bare. I wondered how and even if we would use it, and now, this is where I spend much of my free time during the summer. As you can see, it isn’t a large space, but it’s a very pleasant place to sit and listen to the tree frogs and the owls and the whippoorwills. The challenge was to furnish it comfortably without spending thousands. 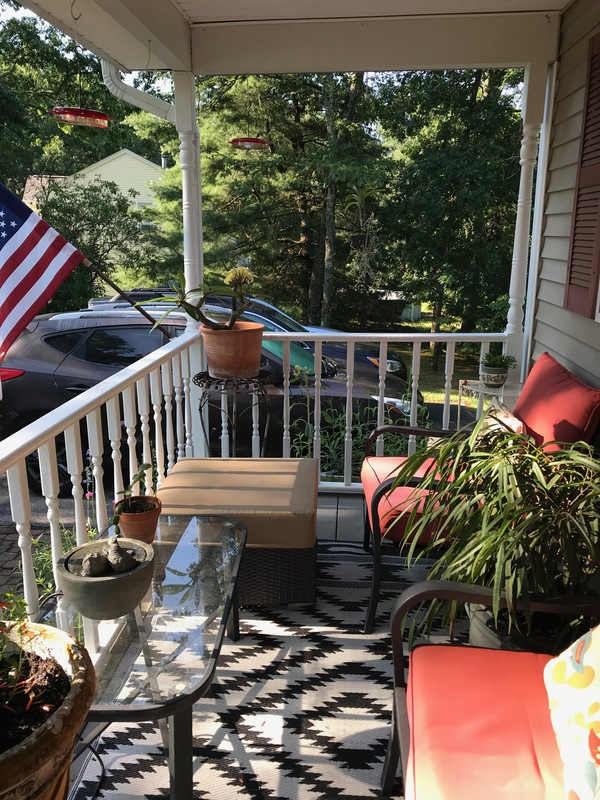 I bought the chairs and coffee table, as well as a loveseat that’s on the back deck, as a set, at our local supermarket (!) a few years go for less than $300. The outdoor rug, from Rhode Island’s iconic Job Lot store, was $10, and I’ve had that for a few years as well. The ottoman with the beige cushion was a birthday present to myself last summer – $200 I think – a splurge, but I am so worth it. 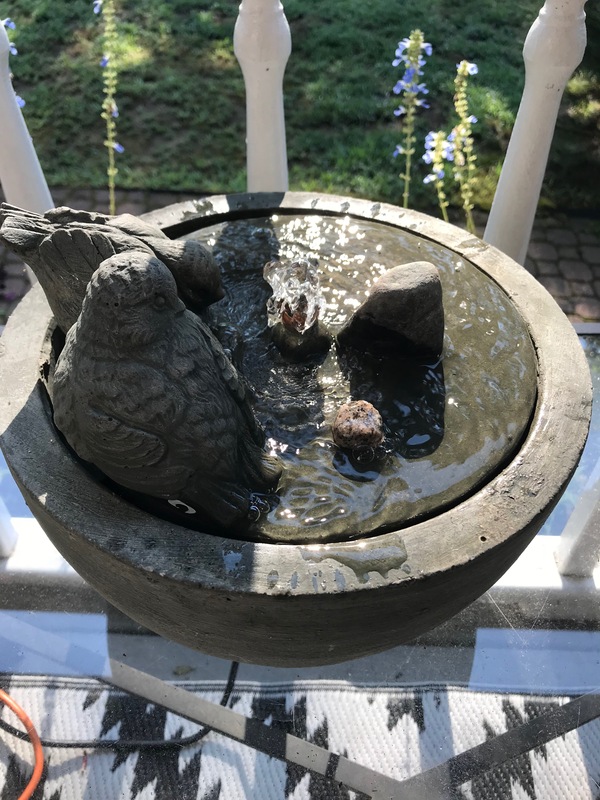 This sweet tabletop fountain came from my favorite local nursery. I wanted one with a flat surface to encourage birds to use it. 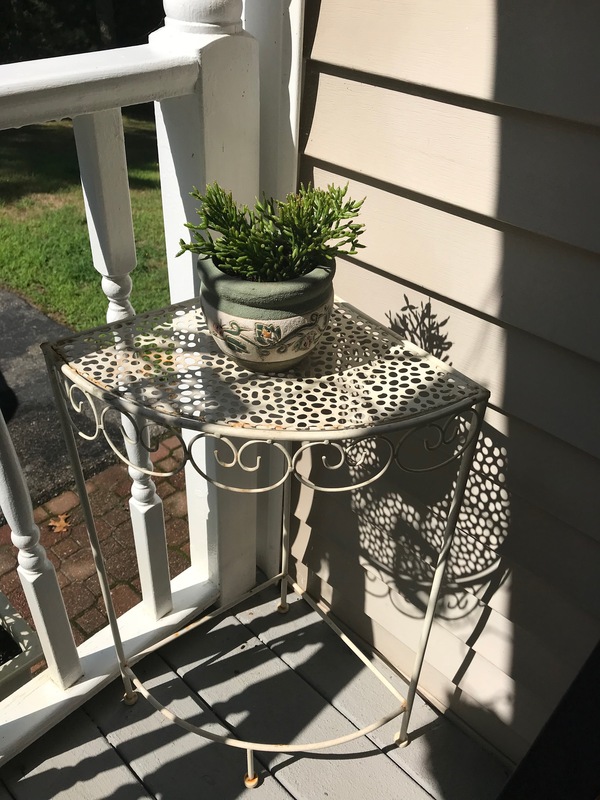 I bought this little corner table at Home Goods for about $10, if I recall. A slightly different view. The throw cushions are from Pier 1. The sabre – leafed ficus lives outdoors all summer and sulks for a couple of months when I bring it inside. I have two hummingbird feeders hanging where I can watch the action (which is considerable these days) and that cuphea, or cigar plant on the left also brings them in close so I can watch them feeding. 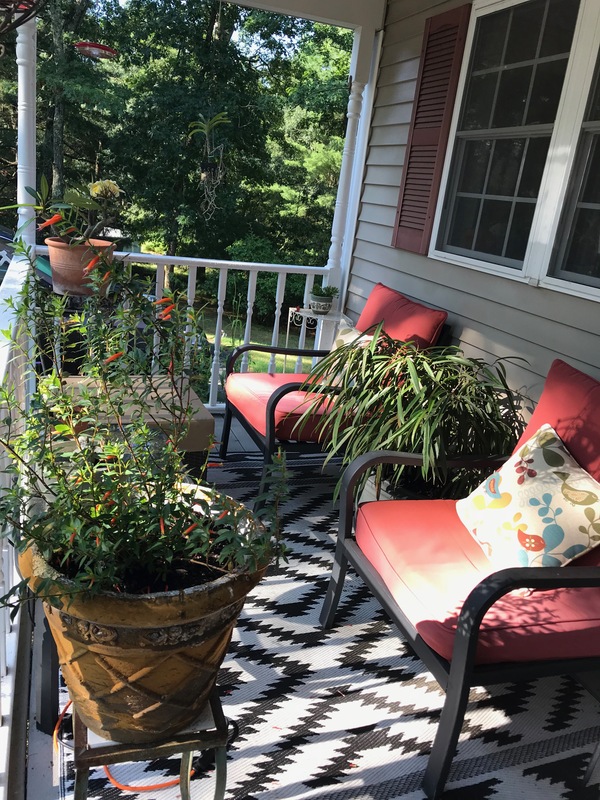 Now I have a comfy, tranquil spot to watch birds, read, and drink my morning coffee, and the roof provides shade and allows me to use it when it’s raining. A great deal of enjoyment for very little money. 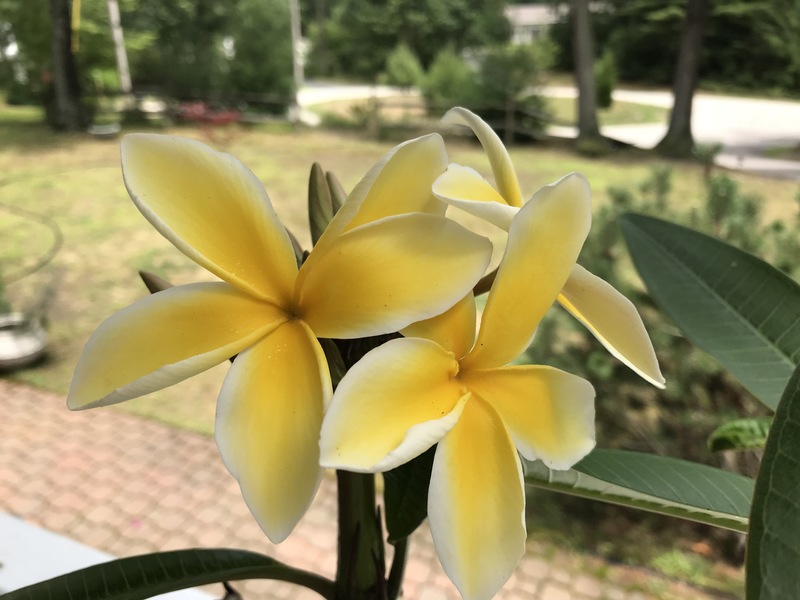 I wanted to share a new photo of my plumeria. I ordered it from a grower in Florida and when I received it in late May, it was just a cutting, so I had to root it. This is a cultivar that has been developed especially for containers. I’ll bring it inside for the winter, follow the instructions and hope it makes it. The flowers (which smell incredible) came first, then leaves started emerging about two weeks ago. 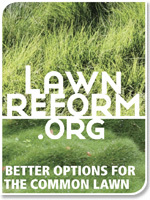 I fertilize it weekly with a granular, high phosphorus fertilizer, again, following the instructions that came with the cutting and other information I’ve gleaned online. 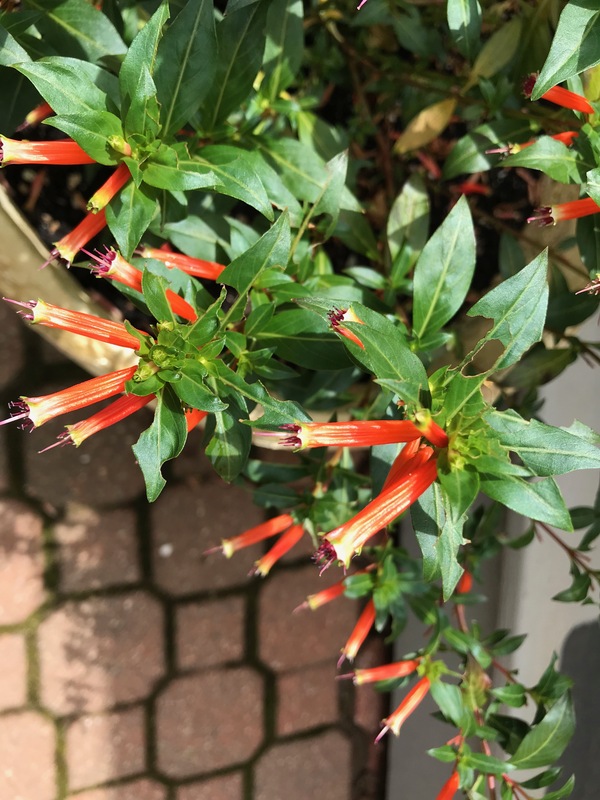 Lest you think I am fixated on a single plant, here’s another summer favorite: cuphea, or cigar plant. 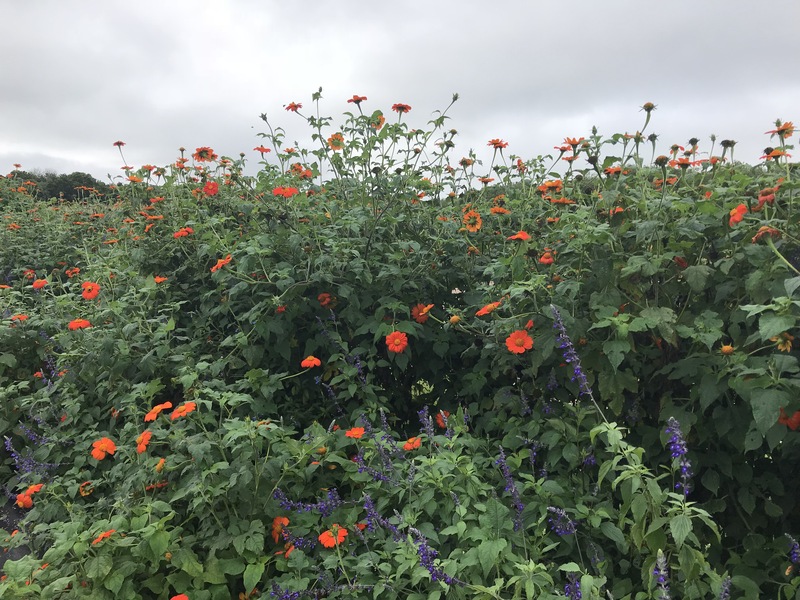 These are grown as annuals in my part of the country, which is Zone 7, but in southern climates, they are evergreen shrubs. This is an undemanding annual that also serves as a serious hummingbird magnet. I have another one on my porch so I can watch the hummingbirds up close as they probe the tubular, red flowers. 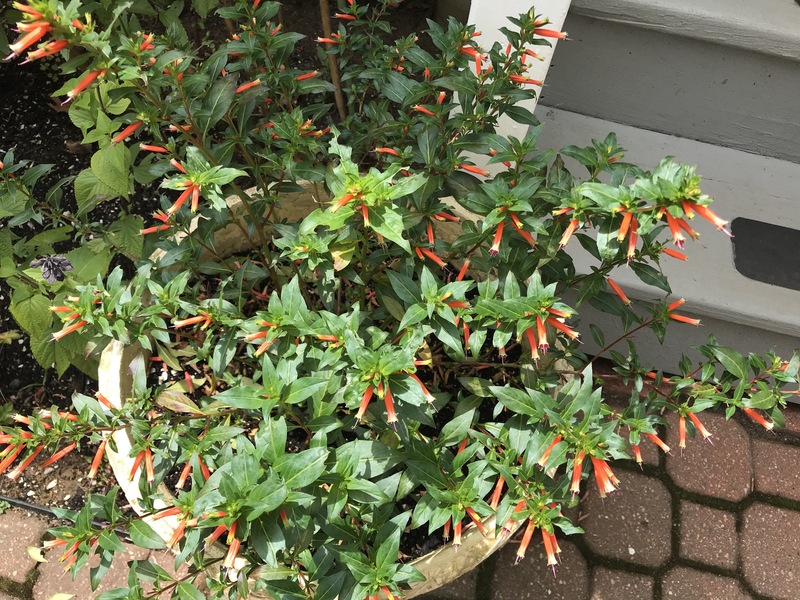 You can find more information on cuphea here.